Several people have asked us about the difference in POA/POI with the RB1 sight on a Glock 19 as apposed to a Glock 17. (I have been using our combination front post and rear notch for quite a while on a standard Glock 17 with excellent results but never on a G19). This was an interesting question that deserved a little field testing to ensure that we were putting out the correct information to our customers. So I had Carlo, our resident Glock armorer install a set of RB1 Combat Pistol Sights onto a Glock 17 and Glock 19 and have them ready for field trials. For those of you that are not familiar with our sights, here are some specs. They were designed by myself in conjunction with 10-8 Performance. The sights features a serrated front and rear with a small .60 tritium vial positioned high in the front post. The front post is .215 high and the rear is .156 wide with a square notch. We believe this to be the perfect combination for combat shooting and the Glock 17 platform. (We are working on other models including HK USP). 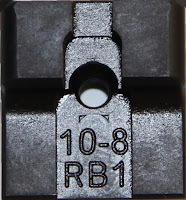 The rear sight features the Redback One abbrieviated brand name stamp RB1 on the top under 10-8 so you will know that you have a set of Redback One originals! We arrived at the range in the early afternoon. The weather was overcast with 100% cloud cover with heavy precipitation on the ground from earlier in the day. The temperature was negligible at approximately 65 degrees. The range was 80 yards in length with the option of pushing back into the weeds another 20 yards to ensure that were able to shoot from 100 yards for the final part of the trial. The target used was a steel plate cut similar to that of a 'C-Zone' of an IPSC cardboard target. The width was 12 inches and the height was 15 (not including the head). 1. Mil-Spec M882 9mm Ball (Grain weight unknown, 115 or 124.) This info was not available at the time of the trial. 2. Speer Lawman 9mm Ball 115 grain. The intent of the trial was to determine any Point Of Impact (POI) shift between a Glock 19 and a Glock 17 using the same set of RB1 Combat Pistol Sights, the same Point Of Aim (POA) and using the above ammunition fired from distances of 25 yards through to 100 yards. Knowing that there is a difference in the muzzle velocity due to the decreased barrel length of the Glock 19, we wanted to determine if the difference in barrel length would create a change in the POI and become an influencing factor of accuracy degradation during the comparison even though we are using the same sights. During the trial, the same POA was used. The POA was midline, slightly high of center. (Upper thoracic cavity-UTC). We began the trial by loading the Glock 19 with 5 rounds of M882 and fired one round at 25 yards from the standing position. The initial results would determine that the rear sight needed to moved to the left IOT impact the center of the steel plate. After a quick re-alignment of the rear sight thanks to Carlo, we were back at the 25 yard line. Results: The next series of rounds impacted the steel at the intended POI. Time to switch to the Glock 17. As expected, the G17 performed in the same fashion, POI was UTC. Time to change loads. All ammunition listed above performed flawlessly and impacted the same POI. We moved back to the 50 yard line and continued the same series of tests. Results: We determined that at 50 yards, all ammunition and weapons performed the same regardless of grain weight or barrel length. All rounds impacted in the UTC with the same POA. The next distance was 80 yards, the edge of the actual range. All rounds were fired from the standing position, weapons and ammunition changed out as per the previous tests. Results: All rounds impacted at the same POI using the same POA regardless of grain weight or barrel length. I decided to push into the weeds and low hanging tree branches IOT to get the final test completed. 100 yards. All tests at this range were conducted as per the previous set. Results: Yet again, all rounds impacted the same location, high to middle of the steel plate. Only one round was low on the plate due to a poor set up on my part! 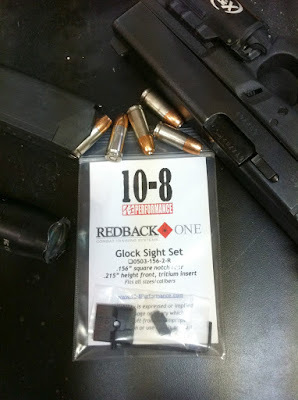 Conclusion: After completing this trial we were able to determine that there is no significant point of impact shift using Redback One Combat Pistol Sights on either a Glock 19 or Glock 17 regardless of barrel length or round selection (given the test rounds). We are now even happier with our latest product and would recommend these sights to any and all Glock 19/17 users that want a robust combat sight replacement for their service weapon or carry gun. I will be testing a Glock 27, 22 and 37 soon! Any chance for a set that's compatible with a RMR equipped G19? We will be doing more sights, whether they will be compatible with and form of MRDS is yet to be determined. Are you going to be making sights for the M&P series? Hey Jason, I'm really interested in your sight set. I carry/compete with a 5" G34. Would your sight set work equally well on that model with the same hold on your tests? If so, I'm sold! !